Metro Manila, Philippines, Nov. 19 — The capital city of the Philippines became a front line in the global class war this November. President Barack Obama and 18 other heads of state and government joined 7,000 corporate CEOs for the Asia Pacific Economic Summit held Nov. 18-19. Obama in particular came to promote the Trans-Pacific Partnership Agreement, a giant “free trade” zone, which will drive down wages, destroy small farmers and force Pacific Asian countries to further open their economies to U.S. and Canadian monopoly capital. Tens of thousands of ordinary people also came to Manila: Indigenous people, workers, farmers, fishers, students and urban poor from around the Philippines and around the world. They came to protest “neoliberal” austerity, displacement and global apartheid. The U.S.-paid Philippine state did not want them there. The military blocked roads leading to Manila and locked thousands of street dwellers and urban poor in detention centers. It deployed armies of police. But clubs and water cannon could not stop the people from bringing their demands and grievances to the gates of the International Conference Center. Many protesters came from Mindanao, the southernmost island of the Philippines, where corporate mining and logging operations are driving people from their land. Among them were Lumad people, an Indigenous people of Mindanao who are being murdered and displaced by U.S.-armed Philippine military and state death squads. Hundreds of Lumads have camped out in Manila despite police brutality and harassment. Others came from farther away, from Palestine and Kurdistan, from South Korea and West Papua, Malaysia, Mexico, Senegal, Indonesia, Australia, Japan, Canada, Guatemala and the front lines of the battle against police terror in the United States. “I will tell our people that we are not alone! Palestinians, like Filipinos, are ready to pay the high price for our freedom,” she said. The APEC summit was not the only powerful gathering of people in Metro Manila that week. 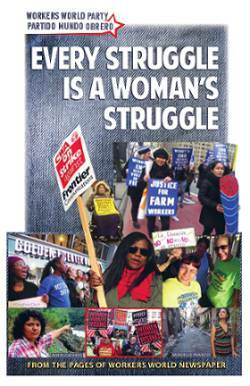 Over 400 delegates and observers from 180 organizations from 39 countries, territories and autonomous regions attended the Fifth International Assembly of the International League of People’s Struggle on Nov. 14-16. They were from workers’ unions and organizations of peasants, Indigenous people, migrants, women, urban poor, students, LGBTQ people, tenants, teachers, medical workers, cultural workers, lawyers, scientists and others. They represented the power of the workers and oppressed, those who produce the wealth of the world. ILPS describes itself as the largest international anti-imperialist alliance existing today. Its assembly was preceded by assemblies of the International Women’s Alliance and the International Migrants’ Alliance and followed by the International Festival of People’s Rights and Struggles. 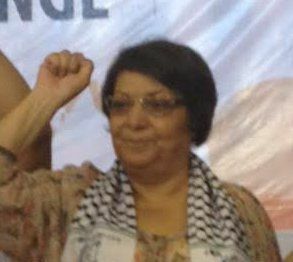 The theme of the Fifth Assembly was “For a Socially Just World, Strengthen Peoples’ Solidarity and Intensify the Struggle Against Imperialist Plunder, Crisis and War!” The assembly opened with keynote speeches by former U.S. Rep. Dr. Cynthia McKinney and Palestinian revolutionary Leila Khaled. Khaled spoke of the Intifada emerging in Palestine today, “an Intifada that, like its predecessors, is based among those who are most marginalized, most oppressed and most determined to seek their freedom.” She called on the international movement of the peoples of the world to support the Palestinian people in materially changing the balance of power and escalating the cost of occupation. ILPS chairperson, exiled Filipino revolutionary hero Jose Maria Sison, addressed the assembly by video recording. Sison said that the assembly is deliberately timed to oppose the APEC summit and neoliberal imperialist globalization schemes that brutally exploit working people and drive the world into a worsening economic and social crisis. He spoke of the current global crisis of the capitalist system, the intensifying exploitation and oppression of the people by monopoly capital and growing people’s resistance. Deliberative meetings of the League’s 17 commissions were punctuated by powerful internationalist plenaries. It was also a fighting assembly. Delegates joined mass actions in solidarity with the Lumad people of Mindanao, with farmworkers on the 11th anniversary of the Hacienda Lusita massacre and an anti-imperialist vigil for the victims of ISIS attacks in Beirut and Paris. Among the delegates was Malick Sy of the National Confederation of Workers of Senegal. He said, “As a trade unionist, we must stand with all people who are fighting imperishable neoliberal economic policies.” He compared APEC to the Africa Europe Trade Zone, which is worsening people’s lives through privatization, deregulation and destroying agricultural production. On its last day, the assembly approved a general declaration and elected a new International Coordinating Committee. That night, delegates and guests from the countries represented joined with mass organizations in the Philippines and sang, rapped, recited poetry and danced to celebrate international solidarity and the spirit of resistance. Highlights included a duet between a rapper from the U.S. and a young Lumad boy, along with a performance remembering the Ayotzinapa 43 in Mexico. The 40-strong U.S. delegation, mostly youth of color, performed the “I Can’t Breathe” song. Jason Martinez of the Indigenous Defense and Resistance Unity Movement (IDRUM) sang and drummed the AIM song.